In addition to supporting the school curriculum, our library provides access to diverse information and ideas, and gives our students the skills and knowledge to apply new learning in both academic and personal pursuits. ISDenver’s one of a kind, multilingual library boasts an excellent library collection of over 18,000 books in English, French, Mandarin and Spanish – plus hundreds of books on CD, DVDs, magazines and other types of reading materials. Our students visit the library with their classes in order to acquire information literacy skills through guided hands-on, developmentally-appropriate lessons that complement their curriculum. 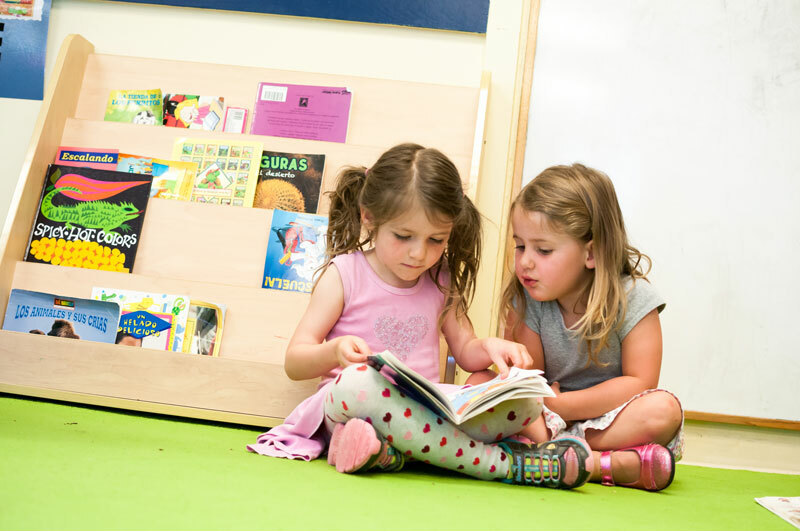 We encourage our students to read a wide variety of genres, in both their target language and English, and ask our parents to talk with their children about their bilingual literary selections. Want to look for books at home, or see what your children are reading/would like to read? Take a look at our Library catalog system on Follett Destiny! Browse all of our literary options - students can even leave star reviews on the books after they are done reading! These brand new resources, from GALE, give all of our learners access to a variety of scholarly pursuits! Learn more and check them out using the links below. You can also access all databases from our GALE database homepage here. Designed to support global awareness, Global Issues In Context ties together a wealth of authoritative content that empowers researchers to critically analyze and understand the most important issues of the modern world. Integrating news, global viewpoints, reference, country information, primary source documents, videos, statistics, and more in a single search, Global Issues In Context brings essential, balanced information to researchers across many academic disciplines, as well as newsworthy topics. Biography In Context offers authoritative reference content alongside magazine and journal articles, primary sources, videos, audio podcasts, and images. Covering a vast array of people from historically significant figures to present-day newsmakers, it’s continuously updated to ensure researchers have access to the very latest information. Research in Context As a middle schooler, research can be challenging, right? You’re not a research guru just yet, and online searches on their own can lead you to unreliable content. Thankfully, Research In Context integrates citable content from magazines, newspapers, videos, and primary sources into an easy-to-navigate database developed with you in mind. Dive into science, social studies, history, literature, and more from National Geographic, Scholastic, NPR, NASA, and other citable sources. Kids InfoBits delivers trusted, age-appropriate online content. Through newspaper and magazine articles, videos, images, and graphics, elementary students can learn about everything from animals and outer space to famous artists and favorite athletes. The database is visual and intuitive, and rewards students’ efforts by developing comprehension and research skills to prepare them for middle school—and a lifetime of learning. Take a look at our Library & Media Science Center on our virtual tour below!